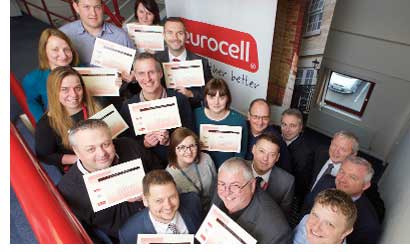 Eurocell has just seen 11 members of staff successfully emerge as the inaugural graduates of its in-house Management Development Programme. The 11 staff had completed the Level One developed for new managers – people who have just been promoted into a management position or relatively inexperienced managers looking to build their skills. Delivered over a nine-month period, the course covers essential management skills, teams and team performance, personal effectiveness and presentation skills. The group was a carefully selected mix of people from different areas of the business, both forging relationships across the company and increasing awareness of the roles others perform within the business. Two further courses have also been developed in association with the company’s major training provider, Maguire Training. Level Two is for managers with a few years’ experience who are looking to build upon their skills and experience to further develop and improve their managerial abilities. Level Three is for experienced managers looking to take their skills to the next level and develop a more strategic approach to management. “We aim to challenge and develop our teams – taking them out of their comfort zone and allowing them to explore different ways to improve their own and their team’s performance,” said Glenn Parkinson, HR Director. Each candidate has the full support of their line management and has a pre-and post-module discussion to assist them in applying their skills and knowledge in the workplace. The course finishes with each candidate giving a presentation to the directors and senior managers, highlighting what they have learnt from the course and how they intend to apply it, before being presented with their certificates. Modules in Levels Two and Three will cover a wide range of subjects including: Managing Change; Effective Performance Management; Financial Awareness; The Manager as a Coach; Personal Impact & Influence; Strategic Leadership; Driving & Implementing Change; Developing High Performing Teams; and Succession Planning.